Nimbuzz is a new-generation mobile service, designed for the online age, making you more mobile. The multi award-winning Nimbuzz application enables people to enjoy free & low cost mobile calls, free instant messaging, social networking and other rich communication features, using the internet capabilities of the their mobile device. Nimbuzz has positioned itself to become the largest global communications platform for seamless IP-based communication among mobile devices and social media platforms. 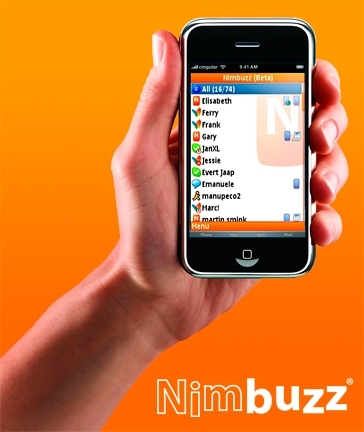 Founded in 2006, Nimbuzz officially launched in May 2008. Nimbuzz is headquartered in the Netherlands, with offices in Argentina and Brazil. The company received VC and strategic funding by Mangrove Capital Partners (Skype), Naspers/MIH (Tencent, Mail.ru, Gadu-Gadu, Mweb, Sanook, Tradus) and Holtzbrinck Ventures (Kyte, StudiVZ). Where does the name Nimbuzz come from? Nimbuzz means "halo" – or “a shining cloud sometimes surrounding a deity when on earth.” It fits our vision of "mobile freedom" very well. Although we are a business and need to be a business in order to survive. We also believe in freedom, expression and the hope that our technology can somehow make the world a smaller, closer, better place by fostering international community, cultural awareness and understanding. That may sound hokey, but we hope to live up to it through our actions, not our words. © 2006-2010 Nimbuzz B.V. All rights reserved. Nimbuzz and the Nimbuzz logo are trademarks of Nimbuzz B.V. This product uses the API's of the different communities like Skype, Windows Live Messenger and Yahoo IM but is not endorsed nor certified by Skype, Microsoft or Yahoo.